spheric or ovoid eccentrically located granules, approximately 1 mcm in diameter, occasionally observed in the stroma of circulating erythrocytes, especially in stained preparations (as compared with wet unstained films); probably represent nuclear remnants, staining with dyes that are rather specific for chromatin; the significance of the bodies is not exactly known; they occur most frequently after splenectomy or in megaloblastic or severe hemolytic anemia. deep purple spherical erythrocyte nucleic acid inclusions observed on microscopic examination of stained blood films. They are most commonly seen in people who have hemolytic or megoblastic anemia, leukemia, thalassemia, or congenital absence of the spleen and in those who have had a splenectomy. Spheric or ovoid eccentrically located granules, approximately 1 mcm in diameter, occasionally observed in the stroma of circulating erythrocytes after splenectomy or in megaloblastic or severe hemolytic anemia. 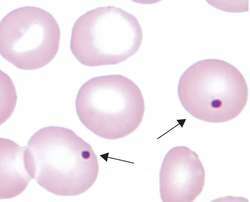 small, round or oval bodies, probably nuclear remnants, seen in erythrocytes when stains are added to fresh blood and found in various anemias and after splenectomy or reduced splenic function. Howell-Jolly bodies showing signs of hemolytic anemia or an affected spleen; also polycromasia and microcytes, which occur in disseminated intravascular coagulation (DIC). Abnormalities in neutrophil counts or cycling, lymphocyte counts, or platelet size and counts, and the presence of Howell-Jolly bodies may suggest immune defects. Howell-Jolly bodies (Figure IV) are present in up to 1 per cent of the cells.